I know the ingredients may sound a little “different”…. But don’t let that stop you from trying it! This is amazing!!! The salsa can be made a day ahead to save prep time and it gives the flavors a chance to settle in. 1. In a small pot, bowl water for rice. Once water starts to bowl, pour in rice. Allow rice to cook until done. Take the mango peel and finely chop, remove seed. Finely chop red bell pepper, green bell pepper, garlic, red onion. Squeeze 2 tablespoons of lime juice and 1 tablespoon lemon juice. Place the grill pan over medium high heat. Rinse the tilapia under cool running water & dry with paper towels to remove excess moisture. Brush both sides of tilapia with oilive to prevent from sticking (if you’re not using a grill pan, please use non-stick pan). Coat the tilapia with seasonings to your desired taste. Coat grill pan with olive oil (or Pam) to prevent meat from sticking. Place tilapia on grill pan for 2-3 minutes each side depending on thickness. Cook tilapia until it flakes easily with a fork. Once everything is finished cooking, take ½ cup of rice and place on plate. 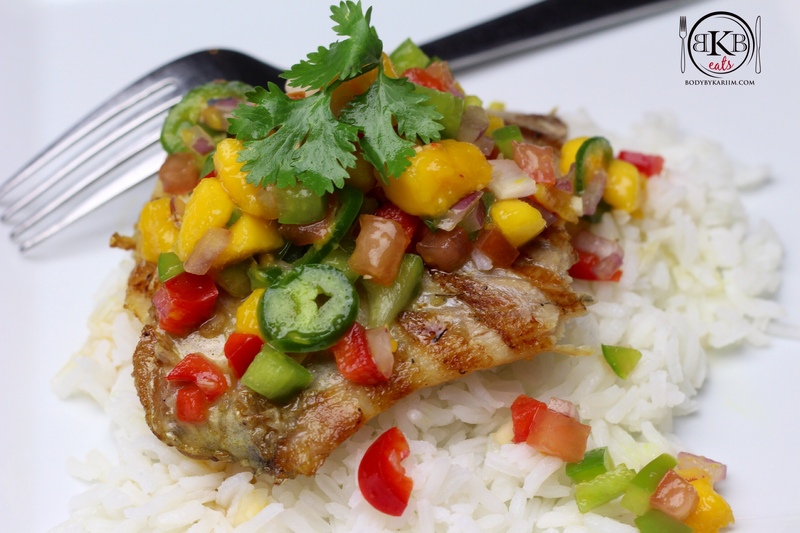 But fish on top of rice and drizzle your fish with the mango salsa.